Believe me I expect you to debate more with civility.. you have a wide range of topic knowledge but I am wishing you use more civil language..
Grevion and layman like this. @Levina @PARIKRAMA Why my posts are deleted?????? Can Anybody specifically reply what was wrong with them???? That was point to point reply and those were all but truth. If you can point any subjective or factual mistake please show me. If you want to cull the Freedom of telling the truth, then be it I am leaving this forum. Scotlander and PARIKRAMA like this. Freedom of truth is much respected and adored, but it should be direct to the topic not the member. Please try to respond without directing at the member. And remember every member is entitled to their view point express them but cant superimpose it on others. And I totally agree with that, but perceptions are often based on feelings, not necessarily on facts. People often "feel" that a politician with a strong character or charisma is better, than a calm and rational thinking counterpart. We all remember the calls for MMS to be more outspoken, Germanys Chancellor Merkel also belongs to the reasonable leaders, Obama had charisma but wasn't considered as strong. Along with these feelings about specific persons, we see people having similar feelings about the situation in the country, which however doesn't need to be real, but just a feeling! Take US or Germany as examples, both countries are in good shape when it comes to economy and unemployment rates thanks to the work done under the Merkel and Obama governments and still people have the feeling that things are bad and we see the result in the US now. Similarly, the feeling that everything was bad under UPA is not correct either, economy was growing (although we faced a global financial crisis and fuel prices were at max levels), just as the number of the middle class was increasing => less poor people. So if we actually want to "know" and not only "feel" how the situation is now, it would be good to know what has changed for the good or bad in the last 3 years. GDP for example of the last UPA year 13/14 was 6.9% (with NDA's revised calculation method), hit 7,6% at max and now is in decline and projected at 7.1% this year (with many ecomimist's having doubts about that figure, since the goverment keep changing stats and calculation methods), which is well within the projections from 2014 before the election and far away from the promised double digit numbers of this government. Unemployment rates went up, the manufacturing and export sectors are in decline, even with the Make in India PR campaign. In defence we see similar things, with the Make in India campaign only being successful as part of the offset policy implemented by the former government. There are not many defence players that brought production lines to India for export purposes. FDI limits have been increased, but still the government was forced to scrap their own LUH and Avro replacement tenders, because of the lack of interest. Scotlander, Levina, PARIKRAMA and 2 others like this. Grevion, Levina and layman like this. Very Much right, But What Mr. Modi has done is significant shift in policy of the previous govt. Growth will kick in after sometime. Than GDP if you check the inflation it will clearly show it is on decrease which means a lot in current situations. UPA was spoon feeding people and but it wont be lasting in long run as without means of development the sectors were going to buckle. NDA has provided means for development. Jus time before it shows results. 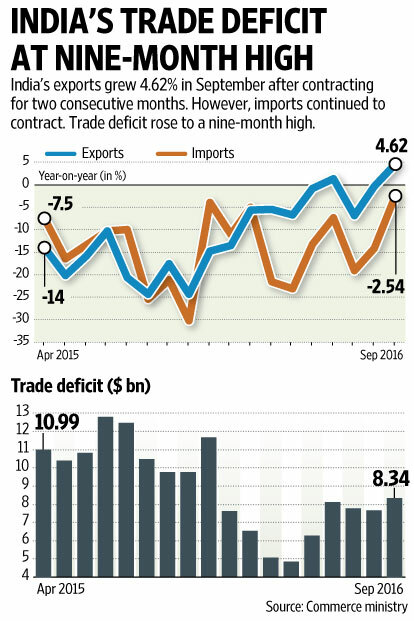 Decline in exports sectors when correlated to other World economy trend can be clearly explained. PARIKRAMA, Sancho and Levina like this. Very Much right, But What Mr. Modi has done is significant shift in policy of the previous govt. In some areas for sure, trying to reduce unnecessary regulations and laws as well as increasing FDI are good intents, but there are no major reforms to actual give a push for the economy. And they even had it easier than UPA, since the government change came during the global recovery. US, Europe and some Asian countries are now in much better shape than between 2008 and 2014. Not to mention that the fuel costs are half of what they used to be, which actually should give the PM more budget to spend and improve the economy. A good PR campaign alone doesn't guarantee increased production and jobs, credible reforms needs to come too, otherwise we will miss a chance. saffron is not just a political color.. its way of life, its way of thinking and it is the color of inclusiveness. saffron is what makes India as India.. because of saffron and what it represntes and tought people there is only one nation India where all religions are and sects are fallowed openly and without fear.. and this is saffron. saffron is about the 10000 years of history (not the history of hindus but of muslim, sikhs, budhist and british too). saffron represent the will to stand again and fight again.. it is the colour of undefeated determination. Scotlander, PARIKRAMA, layman and 1 other person like this. And this is How the things are progressing In "Saffron India". @Himanshu Pandey I think Saffronisation of India is progressing quite well. Just look at Nerhuvian Bigot "Constitutional Expert", Whose Son himself is Serving as Justice in Supreme Court of India, is also a "Zoroastrian Priest", but this Nehruvian Bigot finds objectionable, a Hindu Mahant Being appointed as Chief Minister. BTW it was Hindu India who saved Zoroastrians from Extinction, from Barbaric Clan. SHEKHAR GUPTA: Fali, when you go to bed these days, what is it that makes you happy about the state of our Constitutional democracy and what is it that worries you? FALI NARIMAN: What makes me happy is the vibrant nature of our democracy. What makes me sad is that not too many people who should speak up, speak up for people's rights and liberties. SHEKHAR GUPTA: Fali, when you say not enough people speak for liberties and rights, give us some examples. FALI NARIMAN: When you meet a lot of people, they all are a little wary of the powers that be and the powers that be don't necessarily include government, not exclusively. Powers that be include big companies, big corporate and people like that. So I like this business of social media where people do converse, quite freely, much more freely than the regular press or the regular media and so on. It is there that you pick up all the little gossip that goes on in the country, much of which may or may not be true but at least it’s entertaining. Whereas we find that the media nowadays and I feel bored listening to all the spokesmen of each and every political party every wretched night. Because they all say the same thing on behalf of their respective parties and I don't know why the media, the electronic media cannot invite individual members of political parties who are not spokesmen of the party in order to get their views. I don't see any wrong in that. Why do you only ask the spokesmen because the spokesperson only says what he is bespoken to, he is told that this is what you must say and he will never confess that the party is wrong, never. Neither the leading majority party, nor the opposition nor any other party. Every single channel does this. FALI NARIMAN: I don’t know why these editors of all these news channels invite the same set of fellows. I feel bored looking at them. Every night the same set of channels in every channel. You switch one, switch the other, switch the other. Boring, absolutely boring. They say the same wretched things. Why do you ask the spokesmen, there are so many eminent, decent human beings who have views who may belong to a party or may not. Invite them, ask them their views. Why don't you do that? They do it all over the world, we only don't do this. And one theme runs through all the channels why? Let's have another theme. That's my complaint. They won't invite me anymore. SHEKHAR GUPTA: Get Fali on stage and we are the first to get an admonition. But rights, Fali, which rights are the ones, which citizen rights that you worry about now? Which ones are under threat or which ones are shrinking? FALI NARIMAN: Constitution is under threat. Let me be very frank. With the massive electoral victory in Uttar Pradesh with the priest installed at the instance of the prime minister as the chief minister like the cherry on the victory cake so that is a signal and if you can't see it then you must be either the spokesman of the political party or you must have your eyes examined. Because it’s there, let’s face it, let’s not pooh-pooh about it, let’s not just make fun about it. There is no need to do that. They are entitled to say what they want to but the message is very clear and what you want to do in reaction to that is for all of you to decide, all of us to decide. SHEKHAR GUPTA: You think all of us are not taking sufficient notice of it? We are being complacent? FALI NARIMAN: We are being hypocritical not complacent. You never like to say anything like this. What will the PM say if he finds Mr. Nariman has criticised this. SHEKHAR GUPTA: I will say Mr. Nariman said this about cherry on the cake. I'll fire the gun from your shoulder. FALI NARIMAN: You must give it to the PM. He is quite forefront, he does not mince words and his energy is something remarkable. But there my comment ends. I don't accept all the policies of the PM and I say this quite openly there is no doubt about this. SHEKHAR GUPTA: Does the Constitution have the strength to withstand such a statement of majority if not majoritarianism? FALI NARIMAN: This is the problem. The Constitution has the strength but the people who support the Constitution don't. Here are Members of Parliament, many of them. They are all here in the country. It is for them to question the PM and to ask him. Why has no correspondent of any leading channel asked the PM, 'Prime Minister is it true as Nariman seems to suggest that this is the beginning of a Hindu State?' Ask him and I am sure he will say something which is quite characteristic of him because he is a very enlightened person. Make no mistake. And he speaks his mind. So at least you know what to be prepared for. Please realize this, it is the Hindu majority that gave us this Constitution, 85 per cent people at the time of the Constituent Assembly, 85 per cent members of the Constituent Assembly were orthodox Hindus with Rajendra Prasad the most orthodox of all. They gave us this magnificent Constitution. I dare anyone to say it’s not. It has given us an added advantage with that Bill of Rights, most constitutions don't. And a Bill of Rights that works or is made to work except when it didn't work during the emergency of 75-77. Which gave us an inoculation as it were, what can happen if you are not vigilant. I always say that one should be forthright in one’s views, political views also. Ask the PM is it true, what these people are pretending to say, is there going to be a Hindu state? Please tell us we must know. If there is then there will be an amendment to the Constitution. There is going to be some problem that the judiciary may have to face. No Member of Parliament has asked this, Parliament is in session. Why not? He is a very forthright person. He'll appreciate someone asking him this. Answer he gives is for him. SHEKHAR GUPTA: When some of us ask this question in public debate we are told if somebody can be elected Member of Parliament five times why can't he be CM? FALI NARIMAN: Let him say that. I am asking a different question. He can, nobody stops him. It is a little odd that he should also be a head priest. SHEKHAR GUPTA: Fali, you say you worry about the fact that Constitution is under threat and people whose charge it is to protect it may not have the strength to protect it. FALI NARIMAN: Yes, they protect it in their own interest also. Look how well looked after Members of Parliament are. I was one and I am still looked after extraordinarily well. I get an enormous pension. You are looked after by the state and the state looks after everybody, not just members of the leading party but everybody. It is part of their function to see that the Constitution is protected. They don't protect the Constitution, it's very difficult. I feel for the judiciary to do so especially if you remember the role of judiciary during the emergency which was abysmal. SHEKHAR GUPTA: In terms of all the ups and downs you have seen over the decades, is this the greatest period of threat to the Constitution after the emergency? FALI NARIMAN: After the emergency yes but not since the Constitution. This always happens with a majoritarian government. Majoritarian government which was there during the emergency wanted to amend our Constitution to make it different from what it is. They would have made Indira Gandhi queen. SHEKHAR GUPTA: Or head priest! FALI NARIMAN: Yes, quite right, this is the problem with all majoritarian parties that's why let's not only say BJP, Congress, this that. That's why I always welcome these coalitions. They may be weak, when they are weak, we lawyers are very strong. And judges are stronger still. SHEKHAR GUPTA: How would you compare this period with the oncoming of emergency, six months before the emergency? FALI NARIMAN: There is a comparison. Most of you haven't lived through the emergency, some of us have, so we know what it is to live through an emergency. Very difficult. People don't speak to each other. These are troublesome times. Today in majority community also, nobody says anything. All very worried. SHEKHAR GUPTA: One thing they say is thank God I am Hindu. FALI NARIMAN: Even today 80 per cent of the country is Hindu. It is what the Hindus ultimately say that will be the rule. SHEKHAR GUPTA: It is what the Parsis say which will be the rule. FALI NARIMAN: Oh God no. Parsis are finished. We are the most preferred minority community for which I give Mr. Modi full marks. FALI NARIMAN: He is extraordinarily kind and very generous. I am amazed at his energy. When you meet him at the President’s banquet at eight at night he comes and speaks with you in Gujarati. It reminds me of Rudyard Kipling's poem. Some of it applies to the PM. They have done their homework so they have won this election so massively and so rightly. I don't belittle that. SHEKHAR GUPTA: Six months leading into the emergency and now. Why does it remind you of that? FALI NARIMAN: It reminds me because you have to be beware but to be beware you need to know something. SHEKHAR GUPTA: Nobody cares what happened pre-Google. FALI NARIMAN: That’s the problem, you must know your past, know your remote past too. Students should read Nehru's ‘Discovery of India’. There is not a better book on the history of India. I am a Nehruvian. SHEKHAR GUPTA: Nehru is not so much in fashion anymore. FALI NARIMAN: No not at all. Sardar Patel also wrote the Constitution. FALI NARIMAN: Yes, from 85 to 80. ABHIJEET RAJ: First time Hindu population has gone below 80 per cent and Muslim population has grown 0.8 per cent. So how do you still see that there is a Hindutva factor involved in this? FALI NARIMAN: Because 80 per cent is much more than the entire Muslim population of India. ABHIJEET RAJ: But decline has been for the first time. All this time we have been growing. FALI NARIMAN: Take steps to improve it. Muslims have found a good way. Amend one of your acts, that's all. SHEKHAR GUPTA: What about the other guardian of Constitution, the judiciary. Push comes to shove will they be found as wanting as they were during the emergency or will they do better this time? FALI NARIMAN: Only time can tell but they probably will do better. SHEKHAR GUPTA: What gives you that assurance? FALI NARIMAN: Because many of them know what it was during the emergency or at least experienced what it was. If we never had the emergency we would be on a clean slate. We would not know what it is to be under an oppressed govt. It’s an inoculation. It shows what can happen, what could be there, and never give up Parliamentary democracy. MPs collect their fee and hop off but silence of non- parliamentary democracy is silence of the grave. I am fearful that there will come a stage that there will be an autocratic government in place and the President would have to take care. I still say so. SHEKHAR GUPTA: So the current set of judges, have their recent actions reassured you on Goa and Manipur because it became a challenge in the court. FALI NARIMAN: No, definitely not. No one runs up to the Governor. Governor should say go away . I will invite leader of the majority party. Chief Election Commissioner will tell you. For years and years .That's how Vajpayee became PM. That's what has been going on. I am critical of it but you can't denigrate the whole judiciary. Ultimately we go running to them, even ministers go running to them when they lose elections or are locked up in jail. PROF. ASHUTOSH VARSHNEY, BROWN UNIVERSITY: Is it possible for the judiciary of India or the highest court to give a Hindu nationalist interpretation of the Constitution? FALI NARIMAN: Justice Verma tried it but his was a soft Hindutva. SHEKHAR GUPTA: He tried but is it possible to give a Hindu nationalist interpretation? FALI NARIMAN: I hope not but I fear it. But that's for the Hindus to decide. We minorities are nothing, we don’t count and rightly so, I concede that. You tell us do you want a Hindu state? PROF. ASHUTOSH VARSHNEY: But the judge is a judge first or Hindu first? FALI NARIMAN: He has to be a judge first under our system of law. PROF. ASHUTOSH VARSHNEY: Judge is not supposed to bend to popular will. He is supposed to interpret the Constitution. FALI NARIMAN: We expect the judge to interpret the Constitution in the best way possible. It is a matter of public confidence. You have a fundamental right to enforce your fundamental rights. FALI NARIMAN: I am not afraid, I am just telling you there might be. PROF. ASHUTOSH VARSHNEY: If possibility exists it is because judge is acting as a Hindu first and a judge later. FALI NARIMAN: Absolutely. No doubt about it. It happens always. Prejudices do happen you can't help it. You have to overcome it. The act to preserve the Ayodhya site, had a five-judge bench. The two judges who struck down the act were minority judges one was a Muslim and one Parsi and judges who upheld it were three Hindus. They did not uphold it because they were Hindus but you can say that it was. It's the way you look at it. SHEKHAR GUPTA: How do you look at the recent development in the Ram Janmbhoomi case where the chief justice said this is an emotional issue go settle it outside I can give my services but not as a judge. FALI NARIMAN: How can a chief justice do this? It is unfortunate that he struck his neck out. You decide according to law not according to sentiment. SHEKHAR GUPTA: It is an oxymoron. A transparent, powerful executive. Do today's judges tend to play to the gallery and keep on redefining jurisdiction? FALI NARIMAN: I don't think so. One or two judges may, one two may not. Generalisation is great difficulty. But it is a good thing that press or media keeps everybody under control. Media despite all the failings that it has, it has been a great support for the Constitution. ASHUTOSH TRIPATHI, STUDENT, AMITY LAW SCHOOL, NOIDA: What is your view on minorities running judiciary in the form of collegium? Why don't we see that there should be democracy in that also? These are the five judges who are making all the appointments of the judiciary. FALI NARIMAN: Appointments. This will take me one hour to explain. We fought a big case recently. SHEKHAR GUPTA: Are you for more transparency in the collegium? FALI NARIMAN: Of course and now we have it with the secretariat. Something will be recorded. Dr. S.Y. QURAISHI, FORMER CHIEF ELECTION COMMISSIONER: Indian Election Commission is considered most powerful in the world but our system of appointment has been defective. We must have constitutional safeguard and don't you think a system of collegium for appointing EC is extremely important when you have collegium even for non-constitutional bodies? FALI NARIMAN: SC does not like to interfere with the Election Commission. It itself is of the view that it is the most powerful body in the Constitution today. Imagine if we had an EC which followed diktats of the ruling govt. It would be a disaster, no democracy. QURAISHI: EC does not even take an oath. FALI NARIMAN: Taking oath and misbehaving is not unknown. ADITI, STUDENT, AMITY LAW SCHOOL, NOIDA: Just because we have a Yogi as CM we are anticipating that this will be a Hindu raj or Hindutva. How can you say it will be the beginning of Hindu raj? FALI NARIMAN: You must go and ask Subramanian Swamy. He has said that the correct thing would be to have a Hindu state. It is not my invention. It is only an endorsement which the PM has made. Appointing such a person as CM is itself an indicator of the fact that he wishes to propagate a religious state. QUESTION: There is a phase of judicial overreach and that is a concern. Because you can take it to any limits and where will justice prevail? FALI NARIMAN: But what about executive overreach? It is to correct executive overreach that we have judicial overreach. Where do you stop? If it is a policy decision, then hands off. But in case of executive decision, judges must interfere. Ask citizens who file for relief and don't get relief and are told to go to the executive. QUESTION: Can converse be also true? Can too much judicial overreach be stopped? In name of judicial overreach curbs are put. Can justice system prevent it from happening? FALI NARIMAN: That's not correct. It won't because the judges love it. DINESH TRIVEDI, FORMER UNION MINISTER: From your time in Parliament until now, what is the change you see? Democracy of Parliament is under threat because the presiding officers tend to take the party line and also depend on getting tickets to fight elections. That's why Parliament gets disrupted. FALI NARIMAN: I told the President why can't you experiment. Tell them to please sit in Parliament for five hours. So long the speaker or chairman sits in his chair, the house is in session. Shouting has to stop. I don't want to say about now. My time I learnt a lot, had a great time. JASKARAN SINGH CHAWLA, STUDENT, AMITY LAW SCHOOL, NOIDA: Beef is banned and now people are getting killed for slaughter. I am ready to support it as the Constitution says it’s our duty to prevent animal cruelty but there are so many religions that prohibit something or the other so should that also be prohibited? How does the Constitution give the right to kill someone for it and what is the way out? FALI NARIMAN: For myself, I believe there should not be a ban on anything. I don't accept theory of belonging to a particular religious group. All over the world it is a problem. It is called racism in America and there seems to be a revival of it which is unfortunate. But we don't want that thing to happen. As Gandhi said, 'let wind blow through your house, but don't get blown off by the wind'. I don't know about beef ban, whether it's right or it's wrong. In some cases it may be right and in some cases it may be wrong. But to lock up somebody and go to his house and kill him, it revolts me. I don't think we should have this kind of system. This violence started some years ago and in my view to establish this kind of tendency by violently asserting it is something which is very wrong. Some years ago a group of American judges who came here. One of them, Antonin Scalia, who just died recently, we all expounded our fundamental rights chapter and said, ‘oh! what a great thing’. He said what nonsense are you fellows talking. He says ‘you don't have civil rights act. We in America have civil rights act. Your civil rights act is just about untouchability. You don't have a regular civil rights act which enables citizens to enforce fundamental rights against another citizen.’ That's what is happening today that is violating your right. It is somebody else, a political party opponent who is trying to violate your right. That's where you have to get some remedy and the remedy is provided by civil rights. We still don't have civil rights. RAJGOPAL SINGH, REPORTER, THEPRINT: Do you think there should be a cooling off period for HC and SC judges before they are appointed governors? FALI NARIMAN: No, there should be a complete prohibition. IRA SINGHAL, SDM, DELHI GOVT: Sir, the proposal for Indian Judicial service has been vetoed by the court for a very long time. I have not found any justification for that. FALI NARIMAN: We have tried to move for it. All that is required has nothing to do with the judiciary. It's a resolution for the Rajya Sabha. Only the RS has to pass a resolution saying we need an Indian Judicial Service and there it is. The Rajya Sabha didn't do so. We tried. The Constitution does contemplate unified Indian Judicial Service. Any judge who opposes it is wrong. FALI NARIMAN: It's a dirty word now. I don't trust this business of secularism is at the heart of the Constitution. It is not. I personally believe that this whole buisness between the Congress and the BJP is over this word. I believe you should not use this word. DR. DEEPAK PENTAL, GENETICS PROFESSOR: Sir, my main concern is about the Indian judiciary. How would you improve this foundation because most of the cases first go to the lower court and then it takes too much time there. Maybe high courts and Supreme Court work but what about the lower court? FALI NARIMAN: But you are wrong. The lower courts work under the discipline of high courts. Delays are in high courts. RIYA KHANNA, STUDENT, AMITY LAW SCHOOL, NOIDA: The rise of populist and nationalist sentiment is a trend all over the world. We see the same in India as well with the current ruling which states that National Anthem should be played before screening of any movie. Don't you think this is forcing nationalism? Do you think judiciary can help protect this forced nationalism? FALI NARIMAN: I am a refugee from Burma. When I was small my father was very fond of pictures. He used to go to the films. In the end always it would be God save the king. We all stand for the king but in the lower stalls they would bash their seats and walk out. Nobody wants to do something forced. This is unnecessary. This is one of the fundamental duties. But it can't be forced. QUESTION: When we talk of minorities I am reminded of what Putin said, when you live in Russia you are Russians. So no minorities. Why do we after 70 years of independence are always talking of minorities? Why can't we just be called Indians? Sometimes we demonize one faith because of work of one individual. Media has reported judiciary far too much. Is there something to admonish the media as well as admonish the chief justice for having tinkered with a very important issue? FALI NARIMAN: I don't think there is anything wrong with anybody saying anything. Chief justice saying I should mediate, I am against it. It would be a disaster if we had Putin's way of thinking here. Same case in China, everybody is a Chinese but ask the Uighur in Xinjiang how badly they are treated. And Tibetans too. Everybody is a free man and can do what he likes. QUESTION: We are talking pendency in the judiciary, so where do you find future of mediation in this country? FALI NARIMAN: I am a supporter of mediation. Arbitration is becoming more judicialised than even litigation. I am all in favour of mediation. In most cases mediation does extremely well, less costly but lawyers oppose it. SHEKHAR GUPTA: The issue with the judge in Madras High Court, would you have handled it differently? NEW DELHI: 'This is the longest pronouncement from a person who does not otherwise take much space', Justice Rohinton Fali Nariman said before pronouncing the landmark verdict declaring Section 66A of I-T Act unconstitutional. Justice Nariman, who left his booming law practice to be a Supreme Court judge on July 7 last year, is known for his expertise in Constitutional, Corporate and Civil Law. An ordained priest from Bandra Agiary, Nariman is passionate about western classical music. He is known for delivering short and precise judgments. But considering the importance of the issue, his judgment on Section 66A ran into 123 pages. In another landmark verdict, Justice Nariman had held that plea of death convict for a review of the Supreme Court's judgment upholding death penalty should be heard in open court by a bench of at least 3 judges. Prior to that all review petitions were decided in chambers without presence of advocates. Justice Nariman completed his bachelor in commerce prestigious Shri Ram College of Commerce and graduated in law from Faculty of Law, University of Delhi, where he was 2nd topper in the University. He did Masters from Harvard Law School. He was solicitor general of India from July 27, 2011 to February 4, 2013. He was designated as senior advocate by then Chief Justice of India M N Venkatachalaiah, who had to amend the rules to confer the recognition on him at the young age of 37 against the norm that mandated the advocate to be at least 45 years. Son of celebrated constitutional expert and a much respected lawyer Fali S Nariman, Rohinton does not like to bask in the reflected glory of his father. He enjoys his country home where he finds the environment conducive to listening to western classical music and reading books. there are more who converted to Hinduism.. and not become a news.. and yes a good cheap shot.. couldn't have done better. One INC slave interviewing an other INC Slave.